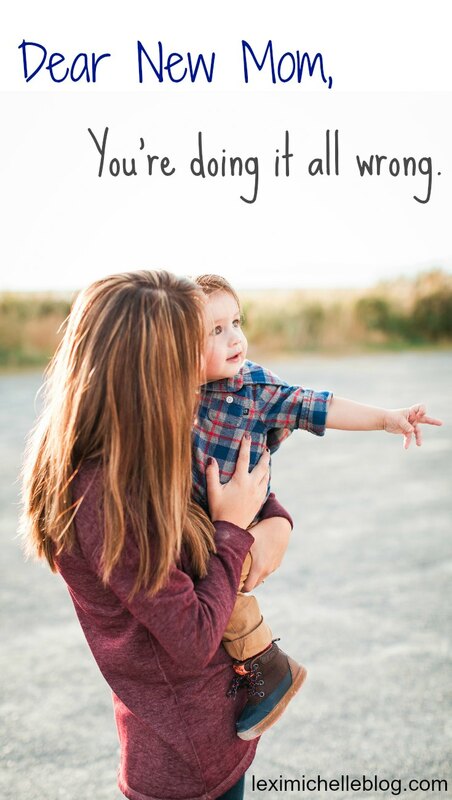 Lexi Michelle Blog: Dear New Mom, You're Doing It All Wrong! Dear New Mom, You're Doing It All Wrong! You are doing it all wrong! I'm serious. It's a miracle your child is still breathing! Every bottle you make, every diaper you change, it's all wrong. Oh, and don't even think about trying to correct yourself by doing the exact opposite... because that's wrong too! Your baby won't sleep? Ha! That never would've happened to me! Clearly, you're doing something wrong! Oh, now I'm babysitting and it is happening to me--the baby is STILL colicky, clearly another mistake YOU made. It's probably your breast milk. You should switch to formula. What?! You actually took my advice and switched to formula?! That is the WORST thing you could've ever done! When I was a mom, my kids were on the breast til they were 2! How could you be so irresponsible! I know it's hard to ignore other people's comments and criticisms. It's hard when all you want is what's best for your child and others make you feel like you're doing what's worst. It's hard because there is no right answer. You're always going to be "wrong" to someone and even if you think you won't let it get to you, it will. Some day in some way, it will. But here's a freeing secret: you don't have to take their advice. What worked for one mom, doesn't necessarily work for all moms. And honestly, they're not going to look at you any more favorably. You will still be, at most, second best to them. They say the definition of insanity is doing the same thing over and over again expecting a different result. It's true. You will drive yourself crazy trying to please the "Experienced Mom." No one will ever live up to their level of expertise, so why bother trying? I don't know about you, but I want to be the person who builds people up and encourages them when they are down. Those who are quick to judge, making others feel inadequate with their comments are really not people we should try to emulate. So please, keep doing what you're doing. You're doing doing it all right! Every bottle you make, every diaper you change, it's all right. Whether you're breast feeding or bottle feeding, using disposable diapers or cloth, baby-led weaning or not; you're doing it all right. No need to worry or second guess. How can I be sure? The proof is in that baby's smile. Now, this is all just MY opinion. You, of course, are entitled to your own. Who's to say my opinion is the only right one afterall..